The experience of the weekend singing retreat with Christiaan B. is multi-faceted. First, the exercises are gentle and respective of the natural function of the human body, without any forcing. This approach is about tending's one voice from the inside, coming to meet your expression of your voice, comfortably and without strain. Attention is on sensing and noticing the inner environment, and supporting the fullness and quality of tone, rather than only on projection of the sound. This approach is to foster allowing the sounds to arise and resonate. The exercises are easy and natural and are designed to work with the body in a soothing way. In this workshop you are invited to experience the glow and energetic effect from the group exercises, as well as gather a collection of tools to continue your journey to discover your voice. Come join with a group of harmonious ones and celebrate your own quality of voice. Thanks for an amazing Singing Retreat! I didn't know what to expect...after all the work I've done on myself, I was surprised that this singing showed me some structures inside myself I hadn't known were there. I'm getting glimpses of the 'me' I am underneath all the cultural overlayment and I am thrilled to be finally able to access this territory! 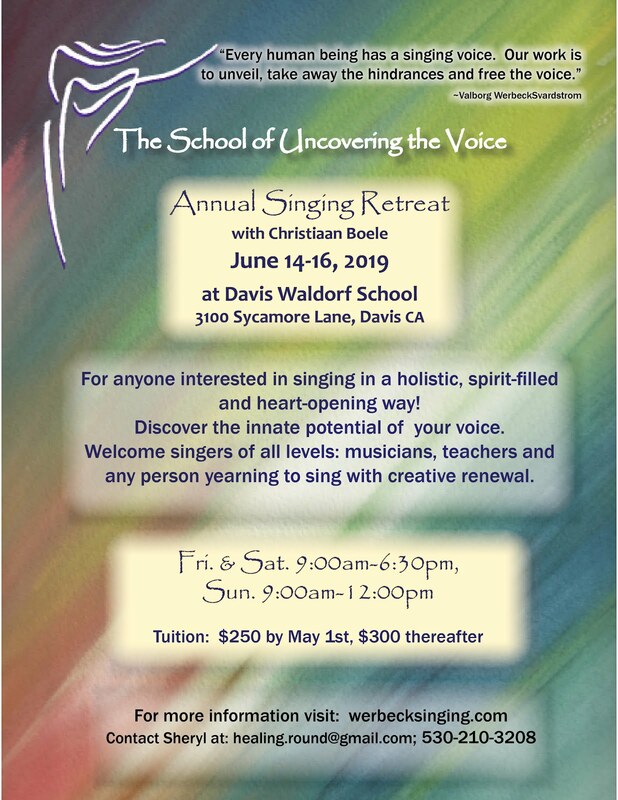 -Lissa C.
The Singing Retreat has been for me a kind of soul-oasis, a place where my spirit drank from waters that fed me more deeply than I realize even now. I have been drenched in pure tone and crisp, precise consonants as well as rich and wide vowels. The spatial dynamics and eurythmy enriched my sense of belonging, both in my physical body and my place in the group, and were a perfect counterpoint to the exercises and singing. To listen to my own voice resonating in clear tones, and at the same time to the voices of those around me, connected me simultaneously to my inner depths and to the depths we all share... This could be called “the voice of Heaven’. And I am ready to get drenched again! -Pamela B.
Christiaan's Open Singing Course is a revolution in the teaching of singing. These technical exercises gently guide beginning and experienced singers into vocal freedom. It is an often-emotional experience that leads you back to the joy of singing. Christiaan Boele's lectures are a work of art in themselves, unwinding harmoniously, rhythmically and melodically. The experience of the Open Singing Course cannot be captured in words. Moving, replenishing, spiritual, inspiring and lovely are some words that come to mind. Christiaan is a gentle, masterful teacher who has crafted a training as relevant for experienced singers as for beginners and self-proclaimed nonsingers. -Dana R.
The quality of your work with us magnifies with every session. For me, your gift of an elevated understanding of the voice has improved and rejuvenated my work with children and adults alike. Thank you. My own voice has been enlivened and is more flexible and pleasurable as well. -Rusty V.
Christiaan, thank you for sharing this gift of singing with such joy, such humor and such diligence. I had a great time at the Open Singing Course and I wasn't stressed at all. (I am very anxious about singing and I almost didn't come.) -Windsong B. During my Waldorf teacher training Christiaan taught us Werbeck singing exercises. In the beginning I merely enjoyed doing the exercises. It was an interesting and new approach to singing which made me forget my doubts about not having a beautiful voice. The exercises felt doable. During the years, however, I could experience the transformational power of the exercises. Not only did they make me calmer and more centered, they also helped me to access my creative potential. The exercises felt like a protective blanket wrapped around my body. I also use the exercises to prepare myself before teaching. My voice has improved which inspired me to incorporate more songs into my lessons.-Tosha W.
Thank you! I have studied singing for many years and appreciate the gentle, soothing, relaxing approach. Reminded me of yoga and of labor-opening. -Beth G.
Just amazing! Really connected me to my voice in a new, spiritual way. -Ken S.
Meeting with the School of Uncovering the Voice has brought me closer to a wholesome singing practice and has provided me with a solid anchor on my vocal explorations, a safe and nurturing place for healing the voice and for growing more intimately familiar with it. In the few years passing since this schooling first reached me, new knowledge has been constantly flowing into my listening and singing, deepening my awareness to space as the habitation of the voice and to the voice's place within it. The Singing Training will allow these understandings to further mature and will serve to continue the cultivation of presence, sensitivity and elasticity that allow the voice to shine through the body. With the help of this sharpened presence, I hope to be able not only to meet the world with my own stronger, more centered voice, but also to impart this knowledge to others who may benefit from it. -David K.
This course is very illuminating to me and supports many of my own discoveries during my forty years of teaching guitar. It has cured my "hopeless" attitude about singing! -Nan S.
Christiaan, you are a delightfully clear and holistic teacher. What a joy you are! -Ann O.
I have appreciated the opportunity to be in the Open Singing Course for these few days. The spiritual understanding of the human being sets these singing exercises apart from other 'warm up exercises' that are even similar in some ways in other schools of singing. it is this subtle yet huge difference that gives the therapeutic element an extra dimension that goes so much deeper than most approaches to the human voice. If one is willing to do the work, these exercises can have a marvelous effect in opening the voice. In essence, it is the spiritual understanding of the singing process and particularly the larynx which contributes to the uniqueness of this work. -Joy S.
Wonderful course with depth, feeling and sharing of such knowledge! -Julie M.
I loved it! Moved to tears! Affirmation of my inner needs. I'm longing for the wholeness. Want more! -Jen A. 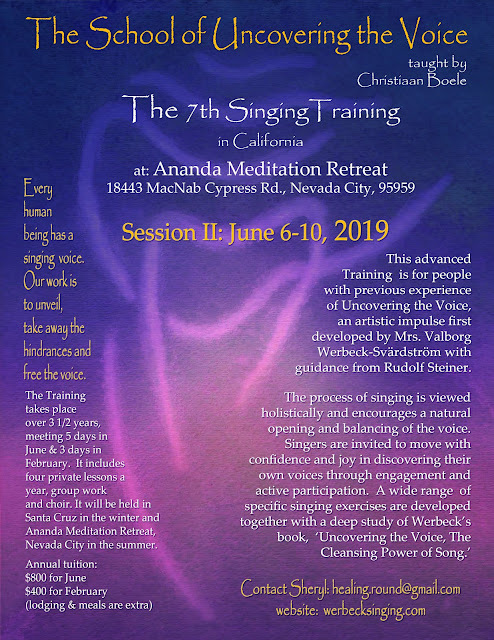 The small bit of Werbeck singing I have been introduced to has been restorative, energizing and healing and has helped bring practical experience and application to many of the spiritual concepts we study in my studio. I personally have been through a long journey of vocal issues while being a lifelong performer and music minister. Werbeck's work has helped me to recover my voice time and time again and continues to assist me in re-training old patterns of strain that I developed in early, less enlightened vocal study. There is nothing I'd rather do than learn more about this incredible co-creative art in which we have the blessed opportunity to allow living sound presence to take form in the world. -Kath R.
Thank you for all the sensitivity and strength you bring to the world cloaked in wonder, beauty and love. Your way in the world brings hope and healing. -Katherine P.
Wonderful! I love the mix of information and exercises! -Noelle T.
How does one speak of "The School of Uncovering the Voice" without sounding too mythical, opening oneself to suspicion, for this is not an easy thing to speak about. When I first came to the Open Course, I was told the work would "Meet Me Where I Was." I silently wondered what that could possibly mean? I grew up with an Amish grandmother, cousins, aunties, uncles and relatives, who all believed in the power of song. I did not know this then, I only felt it. We sang for every occasion; for work, for birth, for death, in four part harmony, without instrumentation. My first understanding of something sacred came from song. Perhaps the definition of Christiaan's work I might give is that one will discover that which is sacred in oneself again. There are things buried in the heart that perhaps only music can stir up again. -Beth N.
Wow Christiaan, what a gift you have given us. A new impulse for our time and FUN too! You have helped me change my life. -Doug C.
The workshop and private lessons with Christiaan have brought me a deep joy and an awakening that I have been longing for. I am very moved by the process of genuinely connecting with the power of the voice and the breath; of experiencing the wisdom and effectiveness of not pushing and not trying so hard... My voice transformed within a week and I already feel more connected with it. Voice exercises from previous teachers used to bore me, but now I actually feel delighted to practice the exercises I learned with Christiaan... I experience these voice exercises as I would a meditation practice. They bring mindfulness, focus and calm to my busy life.. bringing true healing and peace. -Lena P.
Connection, like the ripples when you toss the smooth stone into the water; connection to the lion’s wild mane. Thank you for these lively, living, working moments Christiaan. Joyous,grateful work! This day helped me gain entrance to a spacious sense of true engagement with my voice that I’ve not experienced before, with a sense that this resistance I’ve had can give way to more openness and participation. - Lily N.
more beautiful than even dreams' vast skies. Shayndel's Personal website: http://www.shayndeladler.com/ Certified Teacher of Uncovering the Voice; Ordained Cantor; Waldorf Teacher; Mother; Holistic Health Practitioner, Soul Memory Discovery Facilitator; Graduate of the 4th Foundational Singing Training and the Pedagogical Singing Training.